The charity Pennies has launched a new giving scheme that asks customers paying by card to round up their bills to the nearest pound and give the additional amount to charity. Pennies, which raises money for charities through electronic transactions, has set up a deal with the pizza chain Domino's, so that when a customer buys a pizza online they will be asked whether they would like to top up their bill to the nearest pound, with the extra money going to charity. 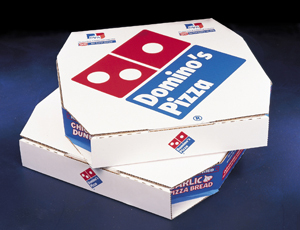 Seventy-five per cent of any donation will go to Domino's chosen charity, Special Olympics Great Britain, which provides sports training for people with learning difficulties, and the other 25 per cent will be evenly distributed between nine charities that Pennies has chosen. It will not be possible to make a donation after a purchase over the phone because the concept behind the scheme is that the consumer is only ever asked by a machine to make a donation, rather than by a person. Hilary McVitty, head of marketing and communications at Pennies, which calls itself "the electronic charity box", claimed this was one of the advantages of the scheme. "The main reason it appeals to people is its private nature and that it is a not a commitment – each time you give, it is a one-off choice," she said. Once the scheme is launched in a shop, it is thought that customers will be asked whether they want to top up their bills by a chip-and-pin device. Pennies will take no commission from each donation because it has been funded by a philanthropist and foundations. McVitty said she expected another online retailer to be using the scheme before Christmas, with up to another 15 retailers showing interest in adopting it in 2011.